About the Author: GlidePlan was designed and programmed by Matt Herron. Matt has been passionate about soaring since middle school when he built his first radio controlled sailplane. 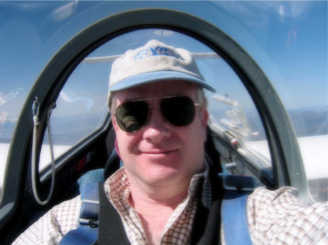 He studied aerospace engineering at Princeton, then product design engineering at Stanford, and took his first glider lesson thirty years ago. But only in the last eight years has he had the time to begin flying seriously. He and his dad got certified at Crazy Creek in Northern California. He flew his first contest five years ago, and in 2013, won the region 11 sports class contest at AirSailing in his Ventus C.
Matt currently lives in Belmont, Ca., where he consults with several high tech start-ups doing mechanical engineering, industrial design, and user interface design. His passions include sailing, diving, amateur film making, programming, and of course soaring.